Charles J. Colonna designed and built this shipyard 10 years after the War Between the States ended. Times were hard and money scarce, but it was an exciting time for this 26 year old ship’s carpenter starting his own business. The Great Struggle had ended and a reunited nation had begun an era of growth never before experienced. The Port was busy and full of vessels in need of repairs; thus Charles J. found himself in the midst of a thriving seaport with every opportunity to succeed through hard work. 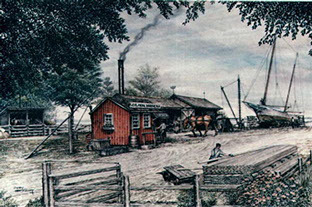 The first years of operation were very hard for Charles J.; there was an abundance of work but profits were quite small and credit, as we know it today, did not exist. Mr. Colonna did have a few things working in his favor. His marine railway had a 50 ton lifting capacity and there were sawmills next door to his repair yard with an unlimited supply of sawn lumber of all sizes and kinds. The Norfolk harbor was an extremely busy place as water transportation was cheap, dependable and took the place of our present day highway, air and rail transportation systems. All manner of transport was by water, from the largest and heaviest materials to the smallest farm produce, including water taxi service from one point to another. The rivers were truly the highways of that day. Most of the small craft were powered by sails, and the Norfolk harbor, on a clear day, must have looked like a field covered with white butterflies. Practically all the vessels were of wooden construction and sail powered and included fish trawlers, oyster boats, barges and bogies. Their construction, maintenance and repair required the skills of ship carpenters, riggers, sailmakers, wood caulkers, painters and blacksmiths. 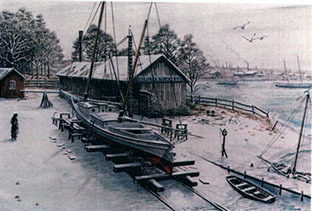 The shipyard was located in what was then Norfolk County, at a point on the South bank of the Eastern Branch of the Elizabeth River approximately one mile east of its confluence with the Southern Branch of the river. This location was on the west side of Main Street where the north end of this street terminated at the water’s edge, there being no bridge there at that time. The shipyard was across the street from the old Herbert home in the section that is now called Berkley; it was diagonally across the river from downtown Norfolk. When the river was bridged and street car tracks were laid about 30 years later, this area actually became part of the City of Norfolk through annexation in 1906.